Marieke van Delft, curator of early printed editions at the Koninklijke Bibliotheek (National Library of the Netherlands), discusses the works of the prolific writer Johannes Florentius Martinet (1729-1795), digitized in the Early Dutch Books Online (EDBO) Project. The Koninklijke Bibliotheek has an ambitious strategy. Together with other parties, the KB wants to digitize the “printed” Netherlands collection (books printed in The Netherlands from 1470 onwards) and make the fully searchable texts accessible to researchers through high quality search functions and to create simpler access for the general public. The KB collaborates with university libraries in The Netherlands and since 2010 commercial parties as ProQuest and Google also have joined the work. This has resulted in the national platform for digitized Dutch books, Delpher. J.F. Martinet, by Reinier Vinkeles (1778), used in: J.F. Martinet, Katechismus der natuur, 1777-1779. One of the earlier mass digitization projects was the Early Dutch Books Online (EDBO) project. In this project more than 11,000 books, published between 1780 and 1800, from the collections of the university libraries of Amsterdam and Leiden and the KB have been digitized. Amongst them are eleven books of the Dutch theologian and philosopher Jan Floris Martinet. Martinet was born in the Southern part of The Netherlands. His father was a minister and Jan Floris choose the same profession. He studied theology and philosophy and gained a doctorate in both disciplines at the university of Leiden in 1751 and 1753. Martinet was an adherent of Physico-Theology, the conviction that one had to study nature in order to truly see the miracles of God’s design of the world. This idea can be seen at the heart of the 20 books which he wrote about nature, history and theology, all aimed at children and reprinted many times over the following centuries. His most important work, the Katechismus der Natuur (Amsterdam 1777-1779; 4 vols., 5 eighteenth century reprints) has been translated into French, German, English and even Japanese. Central to Martinet’s project was a desire to educate. Most of his multi-volume books are in the form of dialogues and often were followed by a shorter version (‘verkort’) that could be more easily read. The books digitised for the EDBO-project consist of those printed in the Netherlands in the two last decades of the eighteenth century, meaning that his popular Katechismus is not amongst them, though twelve others are, nine of them taken from the collection of the KB. 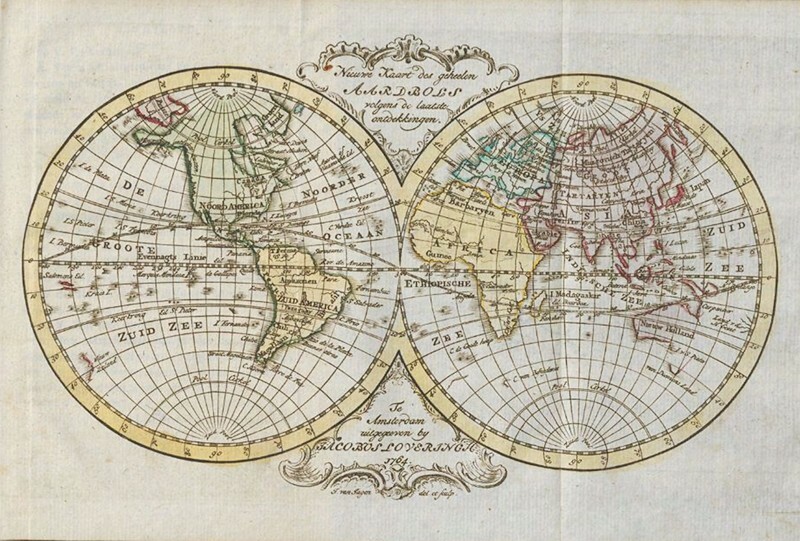 Hand coloured map of the world, from: Kort begrip der waereld-historie voor de jeugd, Amsterdam, Johannes Allart, 1788, after p. 12. One such book is Martinet’s history of the world in nine volumes, Historie der waereld, produced by the Amsterdam based publisher Johannes Allart in 1789. A major work, it was dedicated to the children of Stadtholder Willem V, no doubt because it was a book through which they could learn about the world and so grow to become well educated sovereigns. Like most of Martinet’s output, the book is written in a dialogue. Nine years later, an abridged version was published, Kort begrip der waereld-historie voor de jeugd [Brief Understanding of World-History for Youth]. In this version, with the very first question in the dialogue, we see Martinet shamelessly promoting his own works: Which book would you prefer to possess, besides the Bible and a book about God’s creations (read: Martinet’s Katechismus)? Of course, the answer is: a book about the history of the world. And why? Because one can learn about God’s wisdom goodness and omnipotence. After a short introduction to the discipline of history and Martinet’s method, the book proceeds to present a history of the world, from God’s creation up to the times of Martinet. The history of the Bible is also covered, as is Antiquity, and the history of the people from Japan to Turkey, from Spain to Prussia, as well as from America. In the case of the latter, the question is posed about whether the country’s discovery was good or bad for humankind. The answer? The discovery was good and bad. Five maps illustrate the book and give further explanation. The last pages give an outline of the work. The final answer reads: “Bless him, who sees the highest wisdom of God in the reign of the world en praises the Lord forever”. The 9 volume work and the abridged version, neither of which were translated into English, can both be read in the EDBO. 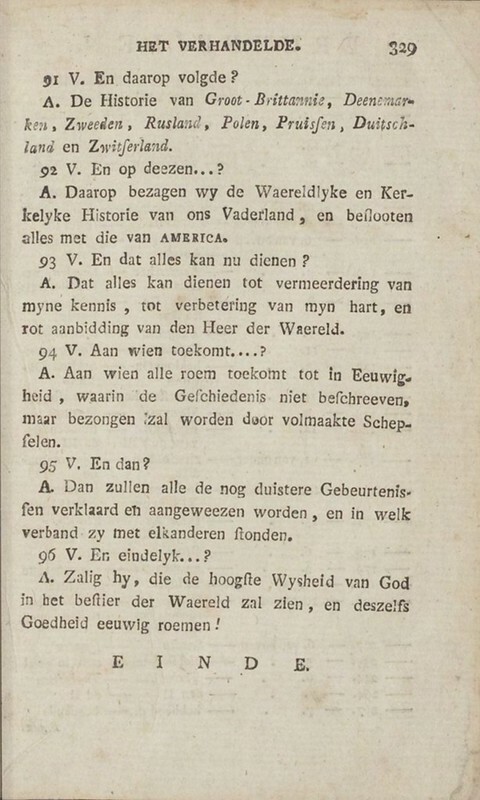 Last page of Kort begrip der waereld-historie voor de jeugd, Amsterdam, Johannes Allart, 1788, with the concluding remark about the wisdom of God. Another book worthy of highlight is Het vereenigd Nederland (1788) [The United Netherlands] which covers the history of the Netherlands, from the Roman period up to Martinet’s own time. The book, also written in dialogues, is created for four ‘young friends’ Martinet had taught. It starts with the question: ‘Hoe zullen wy eenige uuren van deezen dag, op eene nuttige en aangenaame wyze, doorbrengen [How shall we spend some hours of this day in a useful and pleasant manner?]’. The answer indicates the order of importance of Martinet’s fascinations: Zo wy de ernstige overweegingen van den schoonen Godsdienst, en de heerlyke beschouwingen van de Werken der Natuur uitzonderen, dan ken ik geene bekoorlyker stoffe, om eenige uuren van deezen dag, op eene nuttige en aangenaame wyze, door te brengen, dan die, welke de Gefchiedenis onzes Vaderlands oplevert. [Excluding the earnest thoughts of religion, and the lovely observations of nature, then I do not know any other attractive manner to spend the day then the history of our fatherland]. It’s a third choice, but still very appealing. In nine dialogues over the course of 573 pages Martinet discusses the political, economical and cultural history of the Republic and also adds short biographies about important Dutch men. 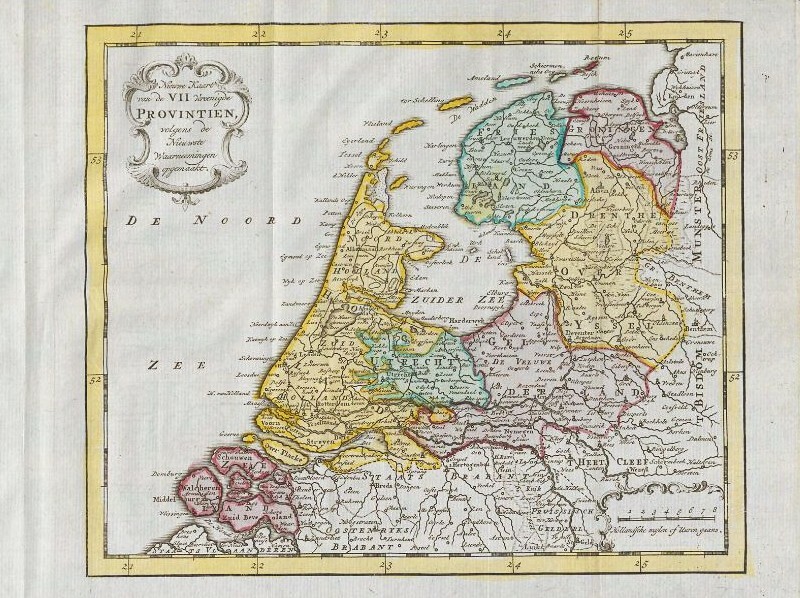 Map of the Northern Netherlands (VII Provintien)., taken from Het vereenigd Nederland. Amsterdam, Johannes Allart, 1788. KB, KW 249 D 37, after p. 8. The book is not abundantly illustrated, only five pages with images, two to a page. At the upper part of one there is depicted the torturing of one of the De Witt brothers – Cornelis, who was to be killed soon afterwards together with his brother Johan by a mob of the worst sort outside the Gevangenpoort in The Hague (1672). Below this is shown a more glorious moment: the return of the victorious fleet after the Battle of the Dogger Bank (1781). Two years after the its publication, a short version of the book was published and was also translated into French. Digital copies of both works are available in EDBO. Pl. VI, from Het vereenigd Nederland. Amsterdam, Johannes Allart, 1788. KB, KW 249 D 37, after p. 446. Martinet’s books have had a great influence – especially his Katechismus der natuur (with more than 20 English editions published up to 1850). His was a ‘household name’ – one who wanted to know anything should read ‘his Martinet’ – and he was central to the education of the Dutch nobility and upper classes throughout the latter half of the 18th century and beyond. His project, to make new knowledge available for children, can be seen as one very much born of the Enlightenment. However, despite his popularity in the 18th and 19th centuries, he was largely forgotten in the 20th, although his name is remembered in the names of streets in the town of Zutphen where he preached and his birthplace of Deurne. Marieke van Delft is curator of Early Printed editions at the Koninklijke Bibliotheek in The Hague, National Library of the Netherlands. She publishes about the history of the book in the Netherlands in different ages as well as digital research methods in the field. She is coordinator of Bibliopolis, Watermarks in Incunabula printed in the Low Countries, Early Dutch Books Online and the Short-Title Catalogue Netherlands. 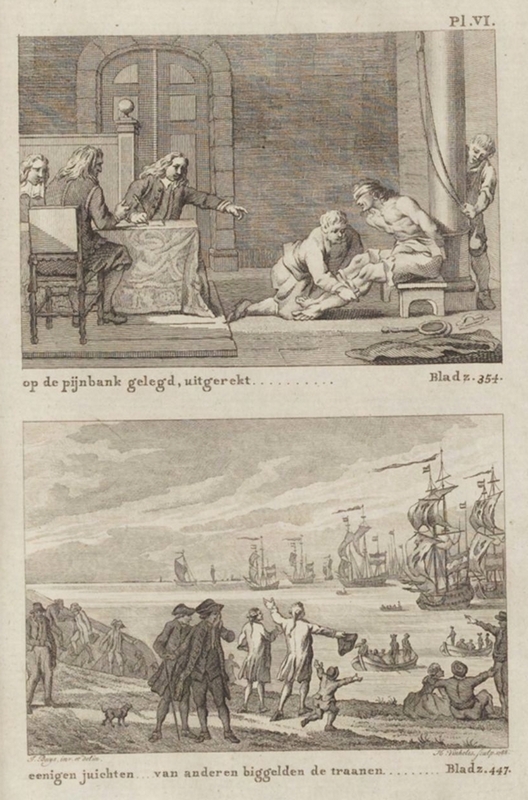 Explore more early Dutch books at the EDBO on the Delpher website. The metadata of the EDBO set is CC0 licensed and individual items and non-substantial parts of the EDBO-set are in the Public Domain – more info here.